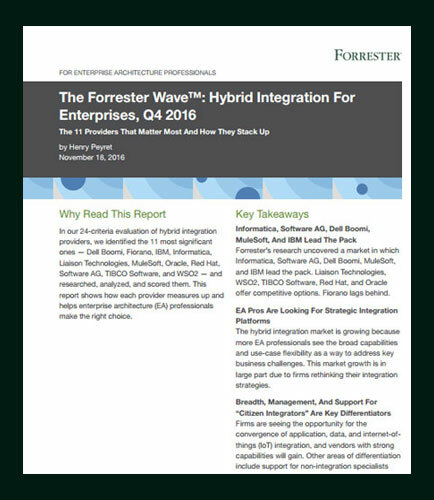 "The Forrester Wave™: Hybrid Integration For Enterprises"
The hybrid integration market is growing because more EA professionals see the broad capabilities and use-case flexibility as a way to address key business challenges. This market growth is in large part due to firms rethinking their integration strategies. To assess the state of the hybrid integration market and see how the vendors stack up against each other, the strengths and weaknesses of 11 top hybrid integration vendors was evaluated. After examining past research, user need assessments, and vendor and expert interviews, a comprehensive set of 24 evaluation criteria was developed and was grouped into three high-level buckets. Hyperconvergence is a type of network integrated system that natively converge virtualization, storage, networking and computing services into software supported by a single vendor. Hyper-convergence can be a replacement of storage arrays in all market segments and companies will no longer need to rely on different compute and storage systems. It’s a unified tool-set to manage all the storage, compute and networking elements as a single device.